Let’s face it; sometimes you need a break from marking. After the last few 50-60-hour weeks where you have marked too much and slept too little, take some time to unwind. In my position as Profweb editor, I don’t think I can recommend a glass of wine in a cosy chair beside the fireplace. 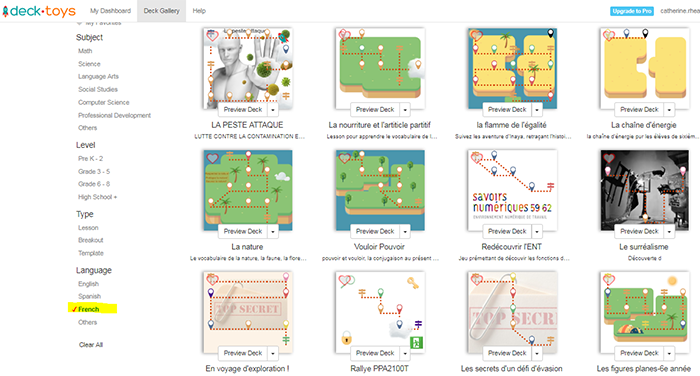 I can however suggest a few fabulous activities, to take your mind off marking, based on articles that have appeared in the French Edition of Profweb in the fall of 2018. Games to get your mind off things? As any gamer, from the dedicated player to the casual aficionado, will tell you, there’s nothing like an online game. Deck.toys is the website that will help you transform your quizzes into an amazing game. In the article, Catherine Rhéaume describes the features of the website. Memory games, associations, crosswords or puzzles can include various formats of questions (multiple choice, surveys, short or long answers, as well as drawings). The amusing learning activities that you create will definitely appeal to all of the gamers in your classroom. Several articles on the French side present tips on how to create a flipped classroom. There is more than one road that leads to Rome! Sample video created by Caroline Cormier and Bruno Voisard for their flipped chemistry class. Even though many of the stories refer to flipping science classrooms, teachers of any discipline can definitely use the pointers given in Julie Belzile and Chantal Secours’ interview: Entrevue avec 2 enseignantes de chimie qui exploitent la classe inversée. They discuss how students must complete an entrance ticket at the beginning of each class. The entrance ticket gives the teacher an idea of how well the students acquired the basic knowledge presented in the video or the assigned texts the students saw in the flipped part before the class began. This just-in-time teaching strategy gives the teacher the opportunity to answer questions or correct any misconceptions before continuing on with more in-depth notions. Mélissa Philippe answers a series of FAQs on entrepreneurship pedagogy in Pédagogie entrepreneuriale: les questions fréquemment posées. From an infographic containing the skills that define an entrepreneur to a short video presenting insights into entrepreneurial pedagogy, this article is an excellent introduction to this experiential teaching method. In addition to discussing the difference between entrepreneurship pedagogy, active learning and the flipped classroom the author answers questions on the underlying theory, the pedagogical sequence as well as the disciplines that can benefit from this teaching method. Obviously not all of the captivating articles from the French side are summarized here. Hopefully though, this year-end review showcased some innovative ideas you may be tempted to try out next session. In the meantime, I hope you enjoy every minute of your well-deserved holidays. Warmest wishes for Happy Holidays from the entire team at Profweb!